In a move that few, if any, could foresee - week in gaming's regular scribe Hugh has disappeared without trace in the past week muttering something about strip clubs, murdering prostitutes and shooting people. Of course, the rest of us have been playing GTA V, but we've still managed to find some time to wallop together this round up of the last 7 days in gaming which, as you may imagine, have been somewhat dominated by the adventures of Michael, Trevor and Franklin. We started the week with the news that Amazon had inadvertently shipped a few lucky souls their copies of GTA V early, Rockstar were suitably outraged by the extra column inches this generated and the last we'd heard Max Payne had been dispatched to a warehouse in Slough with several packs of painkillers and some cough sweets. 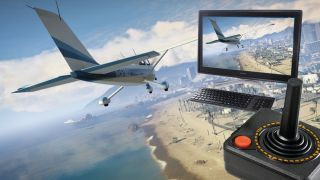 While TechRadar was waiting by the post box for its copies, we grabbed an interview with the game's art director Aaron Garbut who revealed just how he built the world of GTA V, that he doubted anyone would ever discover all the easter eggs and that he'd love to relocate the GTA series to different countries. Fortunately, despite being the most ridiculously over-hyped game of all time, it managed to quickly establish itself as one of the most critically acclaimed. And just in case you thought that a projected $250 million budget was ludicrous for a game the news arrived that it had taken a truly mind-boggling $800 million in its first 24 hours on sale. Not many companies can compete with Rockstar for gaming hype - but back in the 1970s (a decade that only two of the TechRadar team even saw) Atari was even bigger. And when we met up with founder Nolan Bushnell he explained why, but for a few days off, he reckons the fallen gaming giant could have been a contender against the Xbox One and PS4. Another giant that is hoping to give the big two a run for their money - no we're not talking about poor old Nintendo - is Valve. The Half Life, Left for Dead and Portal makers are, more or less, responsible for keeping the PC gaming world current and their Steam Box hardware is kind of a big deal. At a Linux conference head honcho and wheely-desk backer Gabe Newell hinted that we'd get more news next week, which gave us an opportunity to think about open source as the future of gaming and tell you why gamers are now keeping desktop PCs alive. But, we can't let a week go by without looking in the fuuuuuture! So we also updated you on Xbox plans for more Xbox One TV channels and an insight into both how the PS Vita plays with the PS4 and just how many hoops the devs had to jump through to get the Sony hierarchy to agree to using x86 hardware. Rockstar's latest has finally hit store shelves. Find out how the newest game in the series stacks up in our GTA 5 review. Do the new and improved HD visuals warrant purchasing this Zelda classic. Read our Wind Waker HD review to find out. Which indie games should you be looking out for? Here are 20 games that will define the Wii U eShopWill Wii Sports Club encourage families to buy a Wii U this Christmas? Nintendo will be looking to replicate the success of the original with this HD remake. Get the best out of Los Santos with our handy GTA 5 tips guide to help master Grand Theft Auto. Get the latest PS4 info & details with this need to know guide.